He cut a swathe through notions that the BBC should be constrained to supply what the market does not. And, talking of swathes, he referenced ‘Poldark’ as an instance of the happy harvest of positive economic outcomes that is the aftermath of the pursuit of creative excellence for its own sake. 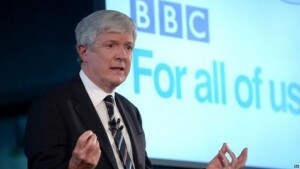 Having taken the high ground, with a winning combination of boldness and good humour, he tackled head-on what he characterised as the weakening of the foundations of the BBC’s independence, over several governments, citing as one example, the use of the licence-fee to pay for non-programme matters. He claimed that the BBC can deliver product more economically but only if un-fettered by unsympathetic regulation; savings are possible but only if the Corporation is allowed the creative freedom to ‘make up the shortfall’. take the BBC firmly out of the electoral cycle by moving to an 11-year Charter period. establish a ‘dual lock’ for the next Charter – any fundamental future changes to the BBC, such as non-renewal of the Charter or a new funding mechanism, would be subject to both a resolution of each House of Parliament, with two-thirds majority and an online vote by the people who ultimately own the BBC: the licence-fee payers. So, ensuring independence and accountability. But what of Wales? A legitimate question, given the location of the speech. Even allowing for the legitimate need to take advantage of a public platform to hit key points relevant across the UK, there were things of Wales strikingly absent from this address. Certainly, warm tribute was paid at the speech’s start to the BBC’s Roath Lock studios as “a world-class powerhouse of drama production” and the knock-on positive effect of that success in the creative industries in Wales, though it was a little odd to have long-established indigenous company Fiction Factory “makers of Hinterland” listed among those who were attracted to the Bay. The BBC’s new Cardiff-city- centre building was credited with the ability to “unlock more than a billion pounds of economic value over the next 10 years” and there were well-deserved name-checks for a number of the latest high-profile productions. After the praise, the exhortation. And that’s it, that’s the reference to programmes made in Wales for Wales, that “and local programmes”. No name checks, no mention of any specific medium, radio or tv. No mention of language. No mention of S4C. The four key issues for Wales are more devolved decision-making within the BBC, better portrayal of Wales in network programmes, better coverage of Wales in network news programmes, and more television programmes made specifically for the Welsh audience to fully reflect our lives. The good news is that Tony Hall promised some movement on three of these, even if there was no detail of any kind. He did say there would be more devolved decision-making, and that they would tackle the issue of portrayal (although it has to be said we have had such promises several times before). He also talked about getting a better balance between UK and Welsh news (although again no specifics). This made his slight attention to programmes for Wales all the more obvious, and all the more surprising given the views of the BBC’s own Audience Council for Wales, which could hardly have given higher prominence to the need for English-language programmes for Wales. One is grateful that the importance of the portrayal, or lack of it, of Wales on the network seems to have been taken and perhaps the need to refresh the commissioning system. However, in remarks made after the speech, Tony Hall seemed to counterpoint ‘Wales to the UK’ with ‘Wales to Wales’ to the advantage of the former. In other words, does the BBC, given tight funding, concentrate on improving portrayal of Wales on the network or the service to Wales itself? At this stage of the debate it is just not an adequate response. This is a crucial point and one on which Wales has at last started to express a robust opinion. The First Minister, Carwyn Jones, has asked for an extra £30m. The IWA has expressed itself forcibly with evidence-based recommendations. Tony Hall asked for feedback. How much feedback does he want? Quite how that’s going to work isn’t clear. Much depends on eventual decisions relating to governance. Wales also needs to pay attention to what was said about the role of risk in creativity since Tony Hall seems to be sanguine about the need to take chances when the creative stakes are high enough. How does that work regarding Wales? Wales seems to be regarded as risky. (Who were the nay-sayers, now happily refuted, he refers to early in the speech who doubted the ability of Welsh creatives?) Because that’s the narrative – they said it couldn’t be done in Wales but we had faith in you and you did it. However that doesn’t seem to be applied to the commissioning of factual programmes so readily. Jenny Rathbone, AM asked a good question about how those least familiar with making their views heard were going to be accommodated. This was a speech in great contrast to the one given in Cardiff in April 2014 when Tony Hall called for a debate about how to address the shortfall in the service to English language tv programming. This time it got hardly a mention. In remarks after the speech, Tony Hall told us that he himself, his father and grandfather were born in Birkenhead but that only at this very dinner had he learned that there was once an eisteddfod in Birkenhead and that it was the one at which Hedd Wyn had posthumously won the Chair. Here is a fact new to Tony Hall but familiar to most in the room. The eisteddfod at Birkenhead has passed three generations of his family by. The eisteddfod at Birkenhead is one of the staple narratives of Welsh identity. The visibility of anything depends on point of view. Point of view depends on location, information and attitude. We see what you don’t see and vice versa. And you see what we don’t see and vice versa. From this meshing of outsider and insider viewpoints can come tremendous creative capacity. There could hardly have been a more apposite, though perhaps unintended, illustration of why it is important for Wales to ‘speak to’ the rest of the UK and to itself. Tony Hall and Director BBC Cymru Wales, Rhodri Talfan Davies are due to speak to the Communities, Equality and Local Government inquiry into BBC Charter review on Thursday 26th November http://senedd.assembly.wales/ieListDocuments.aspx?CId=226&MId=3304&Ver=4 The proceedings are televised on Senedd TV.